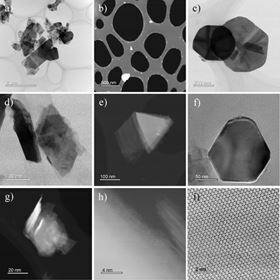 Transmission electron microscope images showing: a general view of two different 2H-WS2 nanoparticle sizes (a), (b); large 2H-WS2 plate-like NPs (c)–(f); a small, irregular 2H-WS2 NP (g); atomic structure of the 2H-WS2 sheet and profile of a thin WS2 NP with several layers (h); and hexagonal arrangement of atoms in a 2H-WS2 sheet (i). Pictures (a), (c), (d), (f) and (i) are BF images, while (b), (e), (g) and (h) are HAADF images. Tiny particles of tungsten-based materials could offer more efficient and greener lubricants, according to researchers from the University of Southampton [Niste and Ratoi, Materials Today Communications 8 (2016) 1]. Oil-based lubricants containing particle-based additives are routinely used to reduce friction and wear between the moving parts of mechanical equipment and engines. Reducing friction improves efficiency by lowering energy or fuel use, ultimately leading to lower greenhouse gas emissions. “There is an urgent requirement for a lubricant additive which can provide superior wear and friction reduction in challenging tribological contacts (high pressures, low speeds, shock loading, frequent stop-starts) but without the toxicity and environmental issues posed by conventional additives,” explains researcher Monica Ratoi. Nanoparticles are excellent candidates for lubricant additives because their tiny size means that they can slip between all sorts of mechanical components and moving parts. But compounds based on tungsten and sulfur or selenium known as dichalcogenides (WS2 and WSe2) have even better friction- and wear-reducing properties because of their layered structure, which exfoliates under sliding – or ‘shear’ – forces. One particular form of tungsten dichalcogenide nanoparticle, called 2H-WS2, consists of flat sheets that, under acidic conditions, have dangling bonds at each corner. These nanoparticles not only exfoliate quickly and easily under shear, but also react chemically with metals like steel at normal operating temperatures (i.e. 100 C) to form a thick, hardwearing film on the wear track. “The tribological performance of 2H-WS2 nanoadditives is superior to that of conventional anti-wear and -friction modifier additives and can improve lubrication and mechanical operation while reducing operational energy usage and the wear of parts,” says Ratoi. High quality 2H-WS2 nanoparticles are easy to synthesize efficiently, she adds, using an exothermic chemical process called self-propagating high-temperature technique. The resulting particles are very stable, non-toxic, non-magnetic, easier to functionalize by changing the surface charge or structure than fullerene-type dichalcogenides because of their flat shape, and disperse well in oil-based lubricants. Not only that, but the nanoparticles are also a glittery silver color, which is appealing commercially, says Ratoi. There are issues to overcome first, however. The large surface area of the flat nanoparticles means that they tend to clump together and form sediments in liquid lubricants. Nevertheless, 2H-WS2 nanoparticles’ superior anti-wear properties, lack of toxicity and environmental friendliness are attractive compared with conventional additives.